VANCOUVER , March 20, 2019 /CNW/ - Boreal Metals Corp. ("Boreal" or the "Company") (BMX.V) is pleased to announce results from a recently completed seven diamond drill hole reconnaissance program (951 metres) at its Burfjord copper gold project ("Burfjord" or the "Project") in northern Norway (Table 1; Figure 1). Drilling at Burfjord was completed on time and under budget. Burfjord is host to numerous high-grade veins with associated copper-rich envelopes developed across a large area (~ 6 by 4 kilometres). The large associated alteration system and widespread copper mineralization support the project's potential to host a large copper deposit. "The results from this widely spaced reconnaissance drill program confirm the presence of broad zones of copper mineralization enveloping high-grade copper veins at Burfjord," stated Patricio Varas , Executive Chairman. 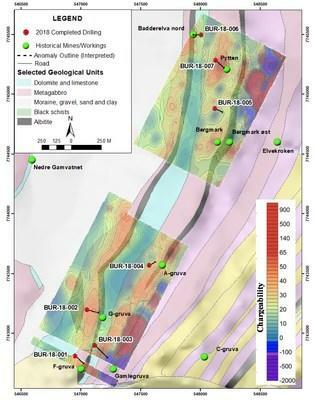 "The 32 metre mineralized zone in BUR-18-003 hole, at the Gamlegruve workings area, has added to the prospectivity of the property in conjunction with historical drilling at Cedarsgruve, where high copper grades had historically been drilled tested." *Lengths reported as seen in drill core. True widths are estimated at 85-100% of reported lengths. No significant results were obtained from BUR-18-006. Table 1. Burfjord drill intercepts. Only limited exploration has taken place at Burfjord in the modern era and before Boreal's recent reconnaissance drill program only one prospect area had been drill tested. The best historical drill intercept consists of seven metres @ 3.6% copper1, and was obtained from the Cedarsgruve (mine) area in the northern portion of the claim block. The discovery of the 32 metre wide zone with grades of 0.56% copper and 0.26 g/t gold at the Gamlegruve workings in the southern part of the property confirm the broad style of mineralization observed in the widespread artisanal workings throughout the Project (Figure 1). 1 Source: NGU Deposit Factsheet, Deposit Area 1943-010, 1997. Boreal's property reviews have confirmed the geologic setting and occurrence of mineralization on the Project and considers the historic exploration data to be relevant as reported in public disclosures and government reports. The Burfjord copper gold project, located in the Kåfjord Copper Belt near Alta, Norway is highly prospective for Iron Oxide Copper Gold (IOCG) and Sediment Hosted Copper mineral deposits which contribute significantly to copper production globally. High-grade copper gold veins at Burfjord that were historically mined (pre 20th century) at cut-off grades of 3-5% copper (see Figure 1) are surrounded by envelopes of stockwork veins or disseminations of copper mineralization extending tens to hundreds of metres laterally into the host rocks. Boreal believes this mineralization has economic potential and represents an attractive bulk tonnage exploration drilling target. Copper bearing veins in the area are dominated by ferroan carbonate, sodium-rich minerals, and iron-oxide minerals (magnetite and hematite), but also contain the economically important minerals chalcopyrite, bornite and chalcocite in addition to cobalt-rich pyrite as generally coarse-grained (often 0.5 centimetre to multi-centimetre scale) disseminations in the veins. The sodium-rich (highly saline) styles of alteration and mineralization at Burfjord are also host to elevated levels of rare elements (e.g., reported Indium; see Table 1), critical "technology metals" that are important to the emerging green energy and other industries. Discreet zones of cobalt and nickel mineralization are also present on the property. The Burfjord project is comprised of six exploration licenses totaling 5,500 hectares in the Kåfjord Copper Belt near Alta in Norway. During the nineteenth century, copper mineralization was mined from over 30 historic mines and prospects developed along the flanks of a prominent 4 x 6-kilometre fold (anticline) consisting of interbedded sedimentary and volcanic rocks. Many of the rocks in the anticline are intensely hydrothermally altered and contain sulphide mineralization. Drill core is logged and prepped for sampling before submittal to ALS in Malå, Sweden where it is cut, bagged and prepped for analysis. Accredited control samples (blanks and accredited standards) are inserted into the sample intervals regularly. Samples are dried (if necessary), weighed, crushed (70% < 2mm), and riffle split into two fractions. One is retained (coarse reject) and the other is pulverized to 85% < 75µm. Pulps are analyzed by ultra-trace ICP-MS (ME-MS41) and ICP-AES Au-Pt-Pd (PGM-ICP23). Over detection limit samples are reanalyzed using ore grade ICP-AES by aqua regia (ME-OG46) or by AAS in the case of high-grade copper (Cu-OG46). This news release contains certain statements that may be deemed "forward‐looking statements". Forward‐looking statements are statements that are not historical facts and are generally, but not always, identified by the words "expects", "plans", "anticipates", "believes", "intends", "estimates", "projects", "potential" and similar expressions, or that events or conditions "will", "would", "may", "could" or "should" occur. Although Boreal Metals Corp. believes the expectations expressed in such forward‐looking statements are based on reasonable assumptions, such statements are not guarantees of future performance, are subject to risks and uncertainties, and actual results or realities may differ materially from those in the forward‐looking statements. Such material risks and uncertainties include, but are not limited to, Boreal Metals Corp.'s ability to raise sufficient to maintain its mineral tenures and concessions in good standing, to explore and develop its projects, to repay its debt and for general working capital purposes; changes in economic conditions or financial markets; the ability of Boreal Metals Corp. to obtain the necessary permits and consents required to explore, drill and develop the projects and if obtained, to obtain such permits and consents in a timely fashion relative to Boreal Metals Corp.'s plans and business objectives for the projects; the general ability of Boreal Metals Corp. to drill test its projects and find mineral resources; if any mineral resources are discovered or acquired, the Company's ability to monetize any such mineral resources; and changes in environmental and other laws or regulations that could have an impact on the Company's operations. Forward‐looking statements are based on the reasonable beliefs, estimates and opinions of Boreal Metals Corp.'s management on the date the statements are made. Except as required by law, Boreal Metals Corp. undertakes no obligation to update these forward‐looking statements in the event that management's beliefs, estimates or opinions, or other factors, should change.